This is me at the Texas A&M University Recreation and Parks Club Halloween party in 1978. I borrowed the flapper dress (which had layers of black swingy fringe that don't show up in this picture) from Lucia Hodges, the wife of one of my professors, Dr. Lou Hodges. I used to babysit their three little girls, Rashelle, Gabrielle, and Danielle, and we became good friends. In fact, I think I borrowed all the jewelry, the head feather, and the garter from Lucia too! When I attended the Texas State Genealogical Society annual conference almost a year ago, I won a door prize from Family Chartmasters. It included a $25-off gift certificate for any of their products or services. 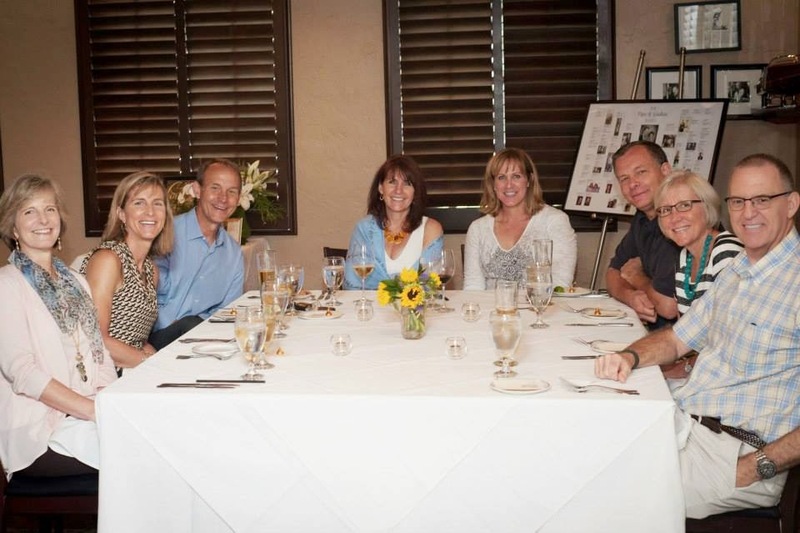 I forgot about the gift certificate for a while (as I tend to do) until I started planning my parents' 60th wedding anniversary party, to be held in early September, 2014. I wanted something to give them as a gift, as well as to use as a decoration at the party. On the Family Chartmasters user-friendly website (lots of helpful info and FAQs), I was intrigued by some of the custom decorative charts shown there. I decided it would be nice to have a bowtie chart, with a photo from my parents' wedding at the center, and their ancestors (back four generations) to each side, as well as their descendants (fortunately, a small group - five children with three spouses, six grandchildren with one spouse and one great-grandchild). The process started with sending a consulting request. You can either have them extract the data from a FamilySearch family tree or submit a GEDCOM file (a standard genealogy file format) or a file from any of a number of popular genealogy software packages. 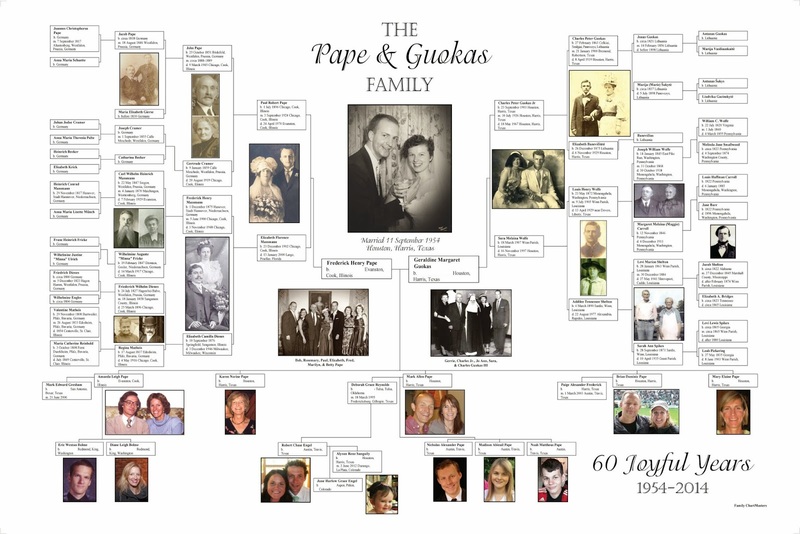 I had them use my family tree on FamilySearch.org originally, but later submitted a GEDCOM file I downloaded from my tree on Ancestry.com. Immediately after submitting the consulting request, I received an acknowledgement that it had been received, which I appreciated. Within a couple days, I heard back from company owner Janet Hovorka, aka The Chart Chick. I had submitted my request just three days before the gift certificate expired, but she assured me they would honor it through the end of the month. Whew! Big points right there to Family Chartmasters! This began an exchange of 39 e-mails over the next month and a half, with Erin sending me .JPG attachments of the progress on the chart. Erin was very patient with me as I added info I'd forgotten to include in the GEDCOM file. She also suggested changes to the layout and to the cropping of photos to create the best possible product. I was pleased to learn that the cost of the chart included up to 20 photographs, so I decided to include all the photos of ancestors that I had (some of which were also wedding photos), as well as photos of the descendants, as extra photos only added $1 each to the total cost of the first chart. Erin even shared the names of the fonts she used for the decorative text on the chart, so that Truluck's could match them for the printed menus for the anniversary luncheon. After the party, I hung up the picture in my parents' home. Now, here is where Family Chartmasters' outstanding customer service really comes into play. Once you order the first chart, additional charts of equal or smaller size (even if more expensive) are half-off if ordered within 30 days. Three of my four siblings decided they wanted charts of their own, and they opted for the more expensive artist grade canvas giclee. However - just after I ordered the chart for my parents and myself, I heard from a distant cousin in my Dienes line. She had located a baptismal record in Germany for our mutual ancestor Fred Dienes (a great-great-grandfather on my father's side). We now had his exact given name and exact date and place of birth, as well as the names of his parents and the date and place of their marriage. All of this was new information which was not on the original chart. When I contacted Erin about getting the charts for my siblings, I asked if it was possible to make the revisions to the original chart, as I wanted to order new copies for my parents and myself. Not only did she graciously agree to make the changes, Family Chartmasters also kindly let me purchase both replacement charts at half-price, rather than one at full price and one at half-price as I expected. Now is that great customer service, or what? Here is the final product - click on it to open a new window and see it in larger format. [I have revised this image to remove the dates of birth for everyone who is still living.] The first 24" x 36" chart on professional paper was priced at $121.95 and the second at $60.98 (half off). Those and the generation map were all shipped together for $11.95 (standard shipping fee for up to three charts). The 24" by 36" canvas charts for my three siblings were also half-off, at $88.48 each, and all three were shipped to one of the siblings in Austin for another $11.95. I also ordered a working "generation map" chart to help me identify missing information and gaps in my research, for the very reasonable price of $39.95. 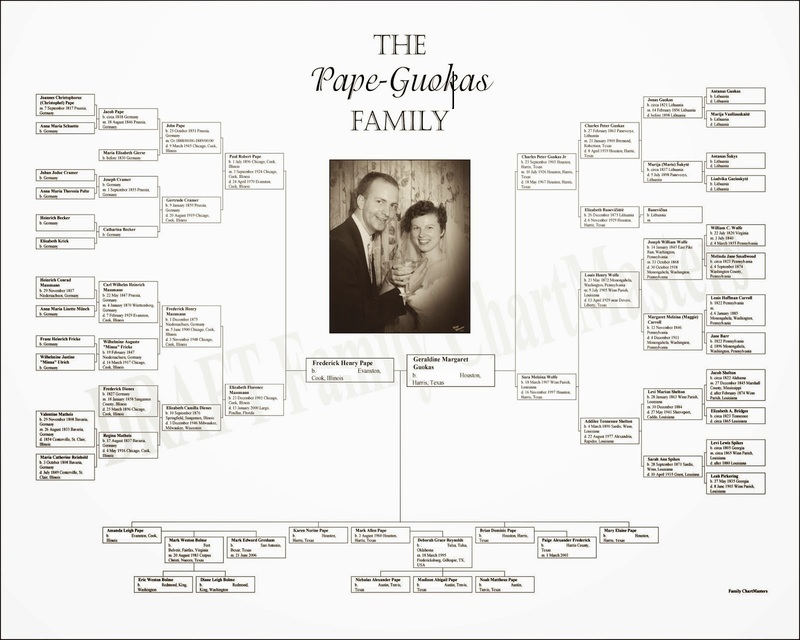 I hope I can find a few of those missing ancestors, and order yet another chart in the future--perhaps with some more descendants on it as well! 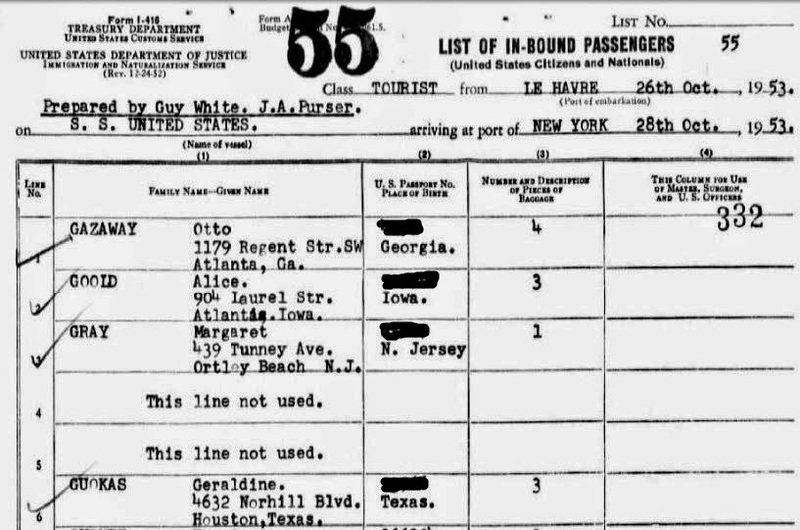 "New York, New York Passenger and Crew Lists, 1909, 1925-1957," index and images, FamilySearch (https://familysearch.org/pal:/MM9.3.1/TH-1971-33984-34033-88?cc=1923888 : accessed 28 Jul 2014), 8383 - vol 18330-18331, Oct 26, 1953 > image 1214 of 1418; citing NARA microfilm publication T715. I blacked out passport numbers. Mom's trip diary ends with the October 23 entry in Le Havre, France. I did find her on a passenger list for her return voyage on the S.S. United States, though. I believe the date of departure listed on this form is in error. Earlier pages of this passenger list show the ship departing Le Havre on October 24, which would be more realistic. Although she didn't write about it in her diary, I'm guessing it took about the same number of days (three) to drive from New York City back to Houston, Texas (via Oklahoma to drop off Joye Murphy), as it did to drive the opposite direction back in August, so Mom and Sylvia John would have arrived home on Halloween, October 31, 1953. This is the 78th and last in a series of posts transcribing entries in my mother's 1953 Europe Trip journal. My nephew Nick recently graduated from college and completed a summer internship with Microsoft in Seattle, where he will be starting a full-time job in March. He decided to do a little backpacking in Europe this month and next. His first stop was Munich. My third cousin Ulrike, her husband Andreas, and daughter Désirée live in that area, and Nick (who's been following my blog) was interested in meeting them. I e-mailed them both and also sent Ulrike Nick's phone number (with his permission) and - eureka! - it happened! 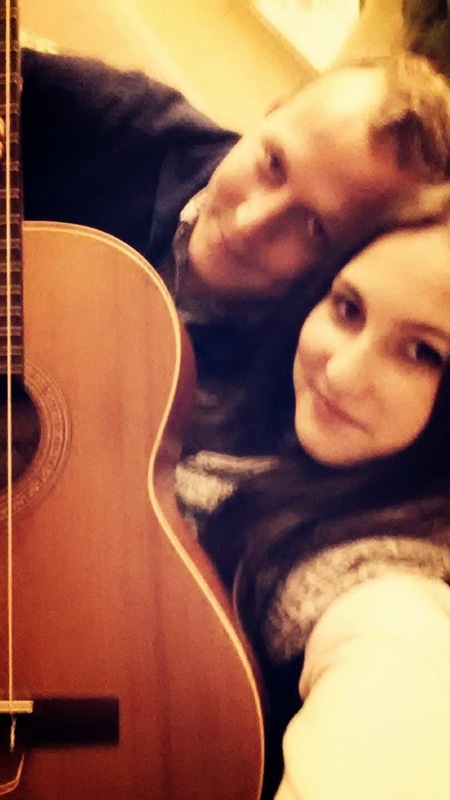 The photo at right is a selfie of Nick and his fourth cousin Désirée, taken at Désirée's home outside Munich. 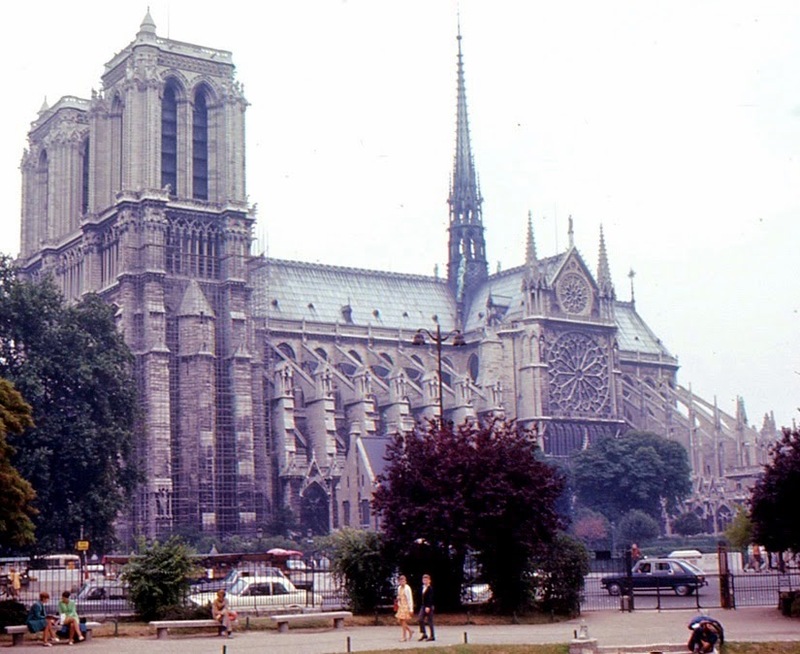 Perhaps inspired by the series I recently finished transcribing his grandmother's (my mother's) journal from her three month road trip in Europe in 1953, Nick is journaling his experiences in Europe in his blog. Second cousins Bob Pape (my uncle) and Karl-Heinz Pape (Ulrike's dad) met about 1976. Third cousins, Ulrike and me, met in the USA in September 1977 and in Germany in April 1982. Now some fourth cousins meet. Thanks for letting us know that Nick is in Munich. We met yesterday and had a good time together. He tried German cake and at night we went out for dinner at a Bavarian restaurant. Later Andreas took him to see the lit up Dachau castle and the overwhelming sight towards Munich and the Alps. Tomorrow afternoon Nick will come out to our home again. Late at night he will be leaving for Amsterdam on the night train. Désirée and Nick are getting along fine - Amanda, you and I succeeded in getting the next generation in contact. That really makes me very happy. That really makes me very happy, too! ** Mom had noted that the mileage on her car when she arrived in New York back on August 4 was 13,900, so this means she drove approximately 8,928 miles on her road trip in Europe. I know from my own recent experience driving 1,729 miles through New England in 10 days that doing so much driving (and Mom did it all) can be exhausting! Perhaps that is why Mom didn't write anything in her trip journal on the way home - she might have been tired! Mom and her companions traveled home once again on the SS United States. I'll post once more on the date they arrived back in New York City. 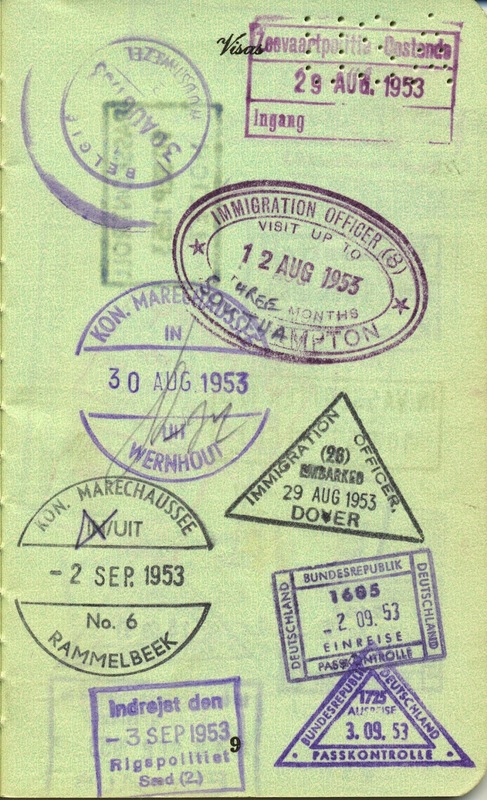 Here are the remaining passport stamps that I have not already used in posts in this series. 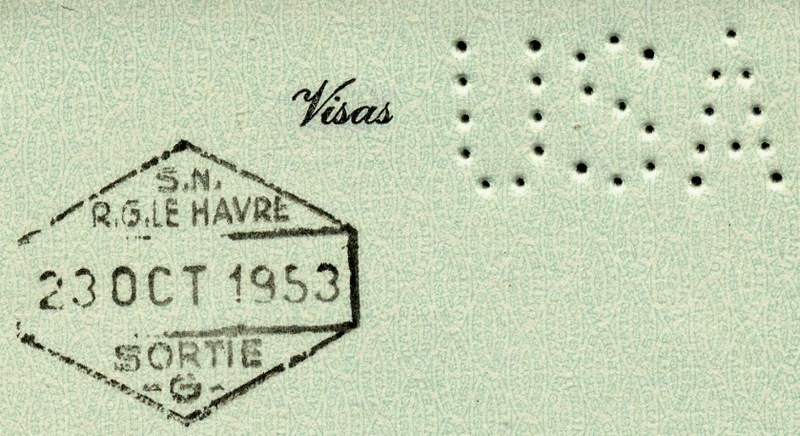 The one above is in Le Havre on October 23, 1953. 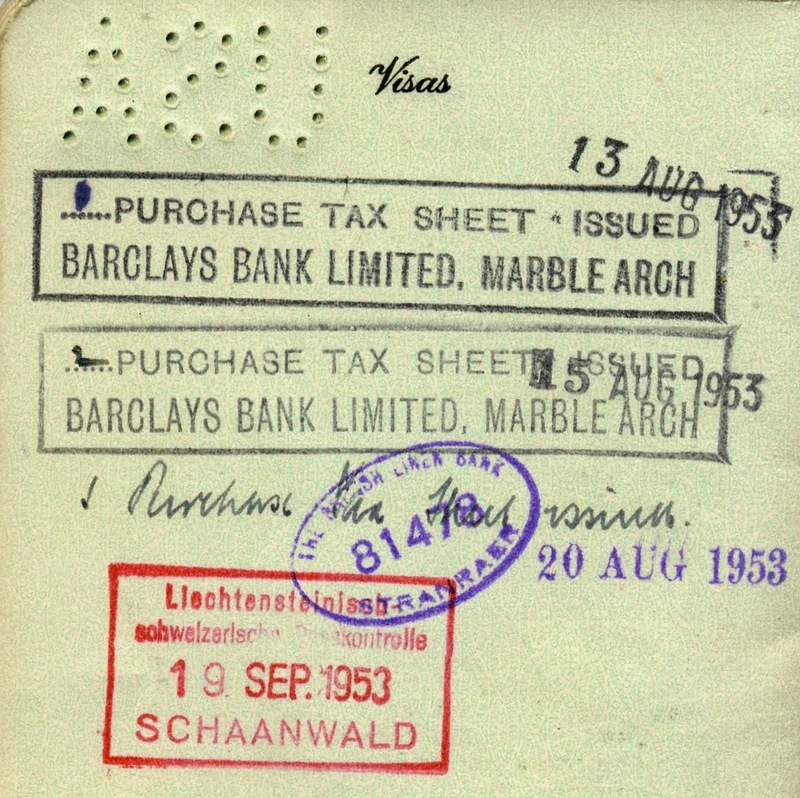 The page at left has stamps from August 12 and August 29 through September 3, 1953. The page pictured below has stamps from August 13, 15, and 20, and September 19, 1953. This is the 77th in a series of posts transcribing entries in my mother's 1953 Europe Trip journal. Checked out of hotel - went to the Museum where the French Impressionists are. * Really did like these paintings especially Renoir, Van Gogh, Monet, and Sisley. Left Paris for Rouen where we plan to spend night** before going on to Le Havre. * Mom would have seen the Impressionist paintings at what is now the Galerie Nationale du Jeu de Paume, which was constructed in 1861 during the reign of Napoleon III. The building originally contained tennis courts (jeu de paume is French for tennis). During World War II, the Nazis used the building as a place to store much of the art they looted from private collections. 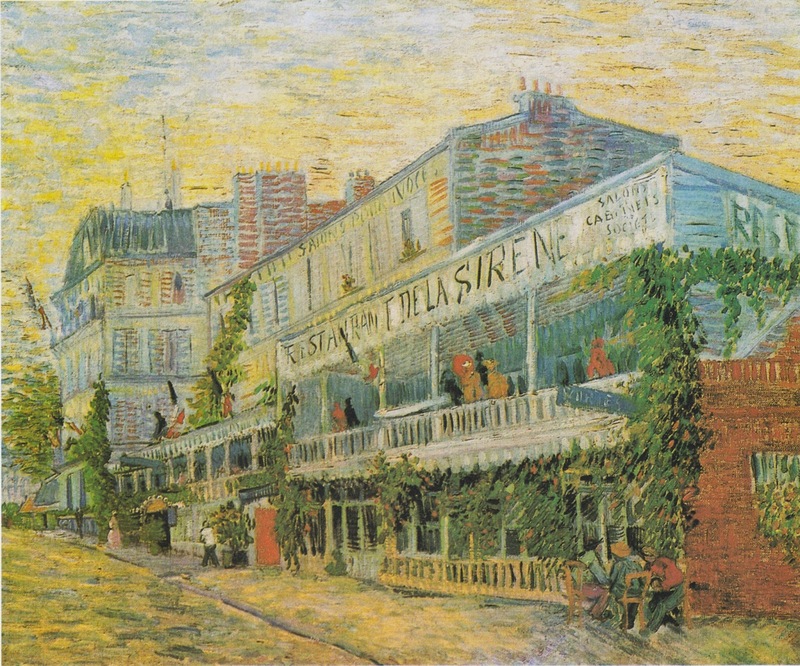 From 1947 to 1986, the building contained the Musée du Jeu de Paume, and held many important impressionist works now housed in today's Musée d'Orsay. 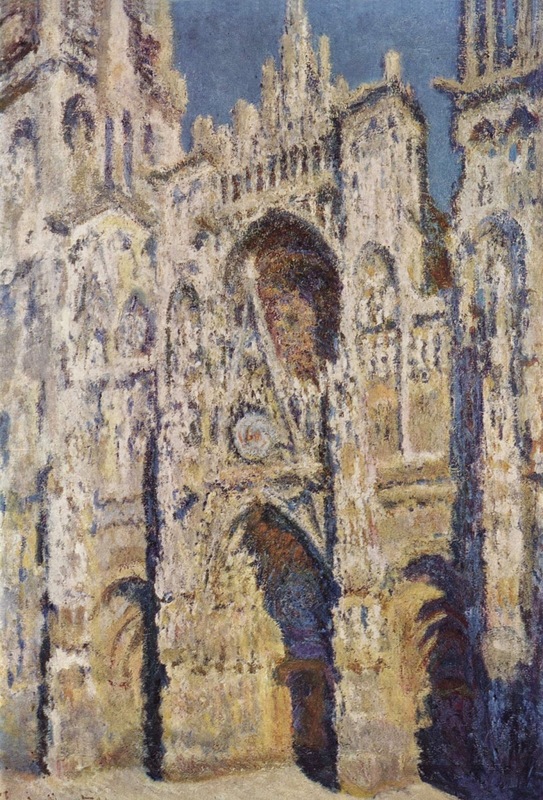 The pictures that follow are by the four Impressionists Mom particularly liked, and I have verified they were at the Jeu de Paume in the year she visited it. All of them are now at the Orsay. 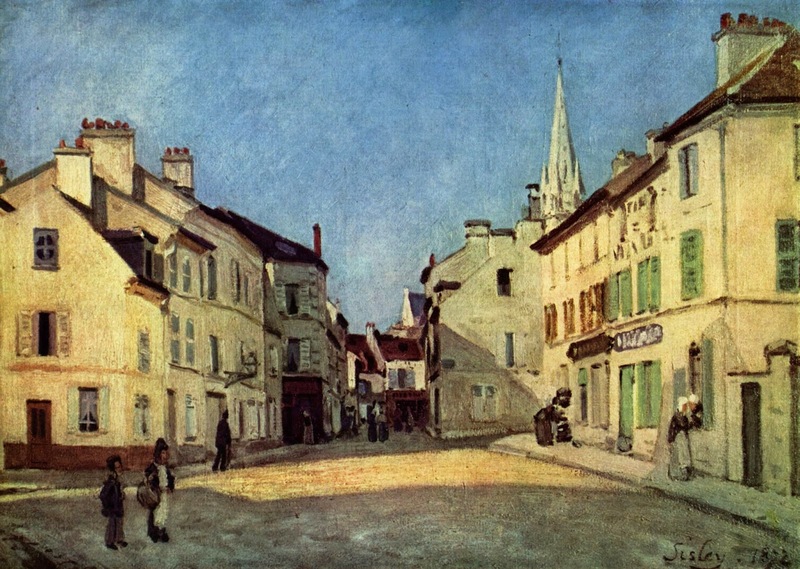 Furthermore, I have chosen paintings that were done in towns that Mom conceivably could have passed through on her way to Rouen: Asnières-sur-Seine and Argenteuil. ** According to the "HOTELS STOPPED AT" section of the trip diary, my mother and her friends stayed at the Hotel de la Poste in Rouen on their last night in Europe. This is the 76th in a series of posts transcribing entries in my mother's 1953 Europe Trip journal. Went to Louvre - saw Venus de Milo, the Mona Lisa, Winged Victory, and several more famous paintings. After lunch at Rumplemayer's, went shopping again. Bought some white gloves,* exchanged Bobbie Nell's** Arpege for larger bottle, and bought Fred** some champagne. * For dinner Joye** and Sylvia** treated me to champagne, because of my birthday. ** Managed to get most of my packing done, thank goodness. * According to the "PURCHASES" section of the trip diary, my mother bought the white gloves at Fabrique de Ganto for 2900 francs, and the champagne at Gargantua for 1700 francs for both bottles. She also purchased 8 hors d'oeuvre knives (for 2440 francs), a salad set (for 950 francs), and an hors d'oeuvre fork (for 300 francs), all at Jacques Franch. ** Bobbie Nell is my mother's step-first cousin, Bobbie Nell Brown. Fred is my dad, Fred Pape, who Mom was dating at the time of this trip. Joye and Sylvia are her traveling companions, her co-worker Sylvia John and Sylvia's friend Joye Murphy. Mom's 25th birthday was two days before, on October 19. The entrance to the Louvre might have looked something like the photo above in 1953. 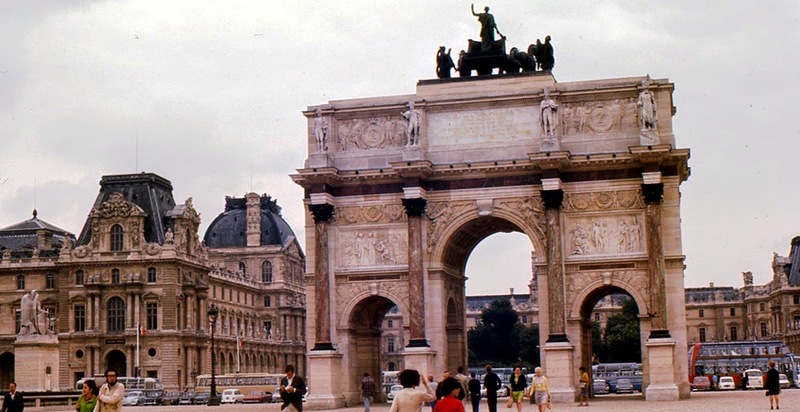 L'Arc de Triomphe du Carrousel was built by Napoleon in 1806-1808, modeled after the Arch of Constantine in Rome. The bulldings of the Louvre (the part that had been the royal palace) are in the background. This was taken long before today's glass pyramid entrance was constructed. The three most famous art works in the Louvre (at least back in the 1950s and 1960s) were the ones my mother saw. 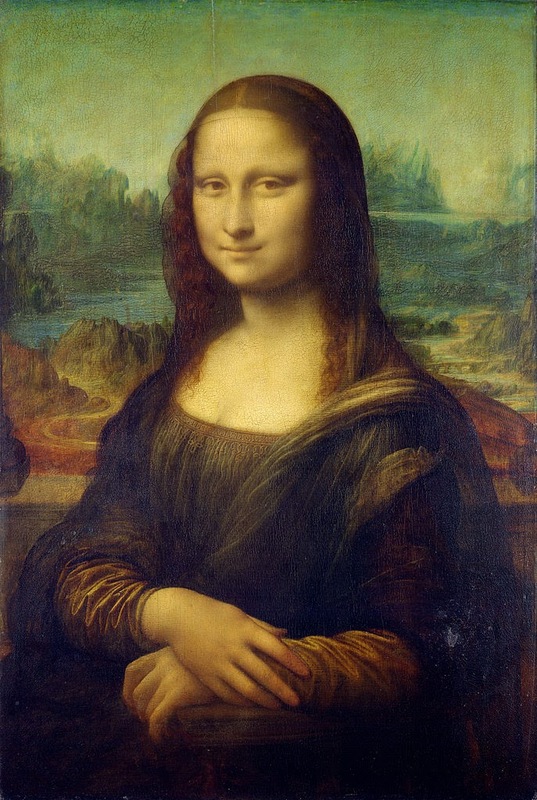 One (of course) is da Vinci's Mona Lisa, pictured below. 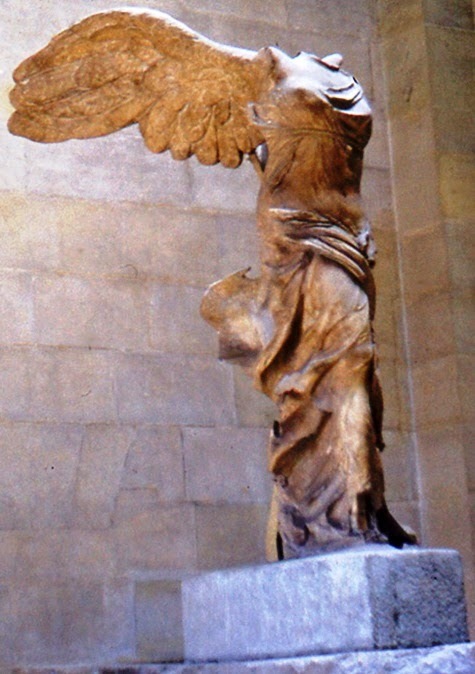 The Winged Victory of Samothrace, pictured at left, was sculpted in Greece circa 190 B.C. The Venus de Milo , pictured at left, was sculpted in Greece sometime between 130 and 100 B.C., and discovered in 1820 A. D.
This is the 75th in a series of posts transcribing entries in my mother's 1953 Europe Trip journal. Went shopping. Bought 2 scarves;* exchanged bottle of Arpege for larger size. 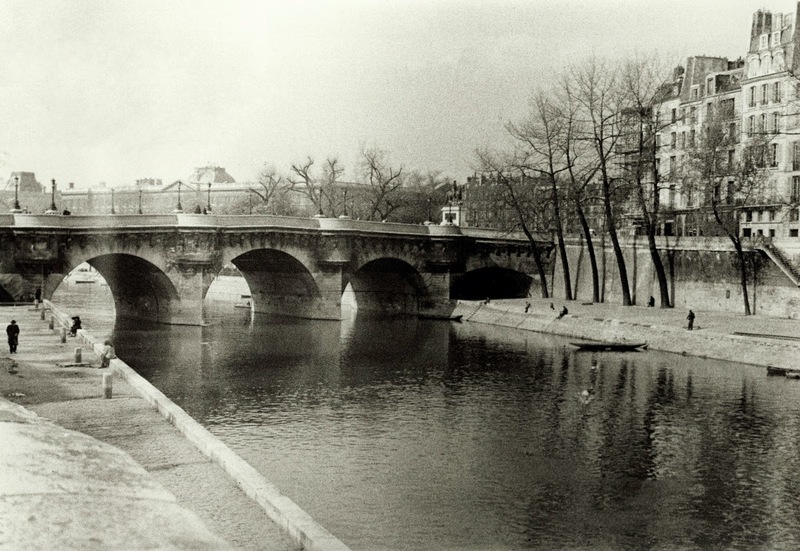 ** After club sandwich lunch at Rumpelmayer's went across Seine River and bought some Édith Piaf records. *** Then walked along Left Bank looking at all the second-hand bookstalls. Bought about six paintings. **** Walked around Notre Dame -- saw a man who had been fished out of the river. Was really tired by the time we got back to hotel. * According to the "PURCHASES" section of the trip diary, my mother bought the two scarves at Denis Francet for 2000 francs. ** When she exchanged the bottle of Arpege perfume she'd purchased the day before for a larger one, the price went from 1650 francs to 2500 francs. *** The five records cost a total of 2740 francs. **** Mom didn't record where she bought the six paintings or how much they cost. 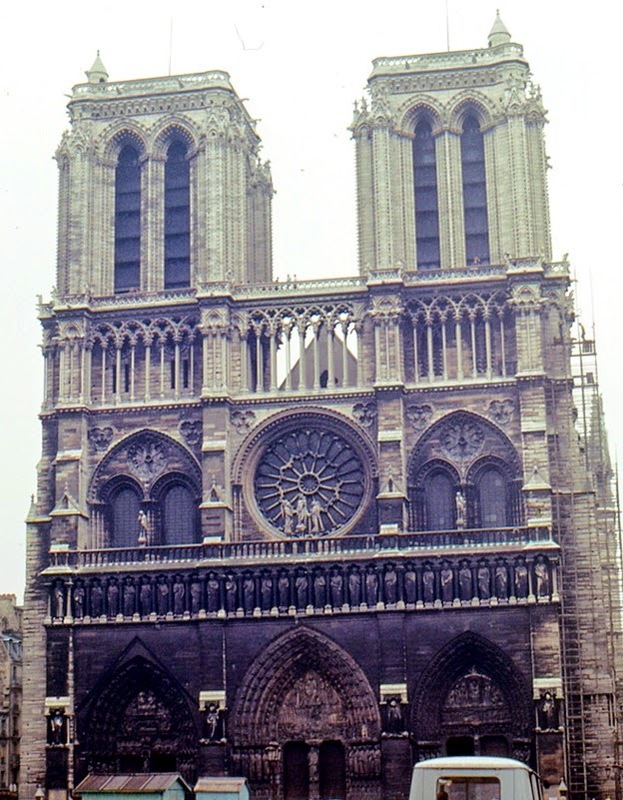 Notre-Dame was built between 1163 and 1345. Its most unique features are the gargoyles that protrude from various points along the exterior (some are visible in the photo above). Many served as channels for rain water. 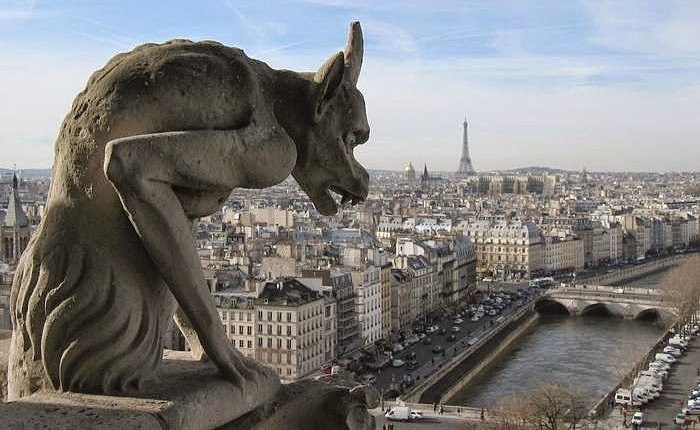 Below is a photograph of one of the gargoyles, with a view to the west of the city. The Seine is visible at the bottom. The nearer bridge is the Petit Pont, and the further is the Pont Saint-Michel. The Eiffel Tower can be seen in the distance. This is the 74th in a series of posts transcribing entries in my mother's 1953 Europe Trip journal. Went to American Express and had 8 letters -- 3 from Fred. After breakfast, went shopping for perfume* -- bought almost all that I have to buy. Also bought three silk scarves. ** Walked down the Rue de la Paix, Place Vendôme, Place de la Concorde. For supper tonight had snails. They aren't very pretty and do not taste like anything too much. ** One scarf was purchased at Monik for 900 francs, and the other two at Bentley for 850 francs each. ***In French, L'Heure Bleue means The Blue Hour and Robe d'un Soir means Evening Dress. 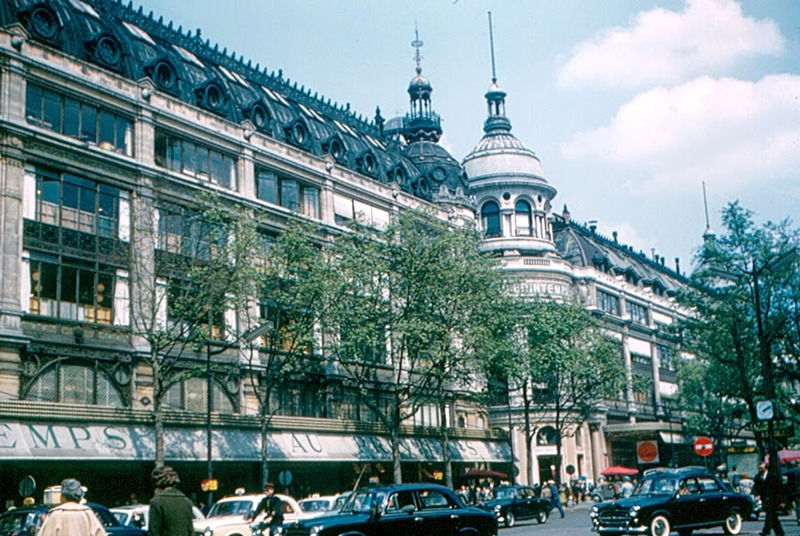 Au Printemps (French for "in the [season of] spring"), pictured above in 1960, is a department store in France that still exists today. 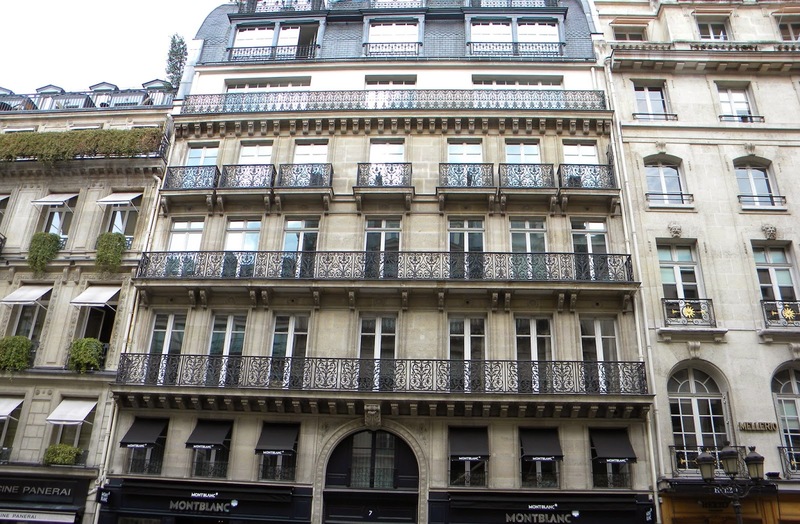 It opened at the corner of Le Havre and Boulevard Haussman in Paris on November 3, 1865. It was rebuilt at that location after fires in 1881 and 1921. 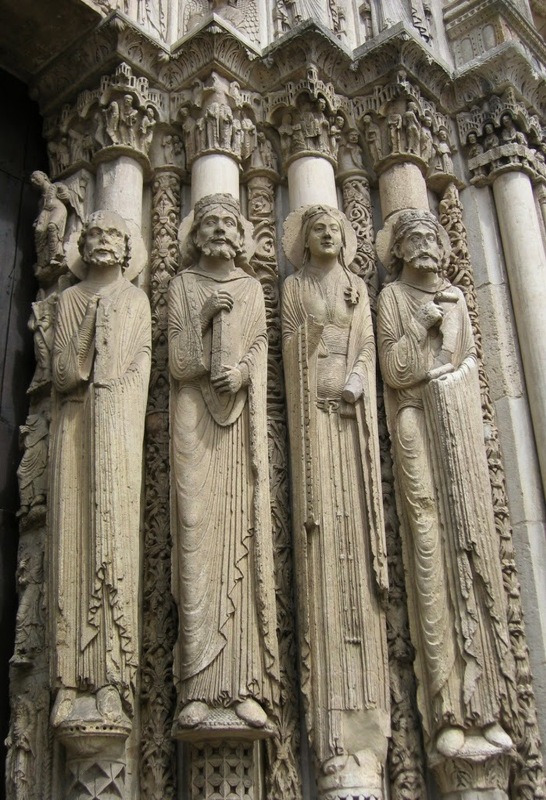 The figures of the Four Seasons on the façade (pictured at left) were sculpted by Henri Chapu. The store was a pioneer in many ways - one of the first with electric lights and elevators, It also changed retail business practices with such ideas as set prices, discount sales, and window models for the latest fashions. The Rue de la Paix (pictured below) is a main shopping street in Paris. It was created on Napoleon's orders in 1806 and was originally named for him. It runs from the Palais Garnier to the Place Vendôme. The most notable feature of the Place Vendôme is the Vendôme Column, pictured at left. It was built on Napoleon's orders between 1806 and 1810 to celebrate his victory of Austerlitz and is modeled after Trajan's Column in Rome. It is covered with 425 spiraling bas-relief bronze plates made from cannon captured at Austerlitz. 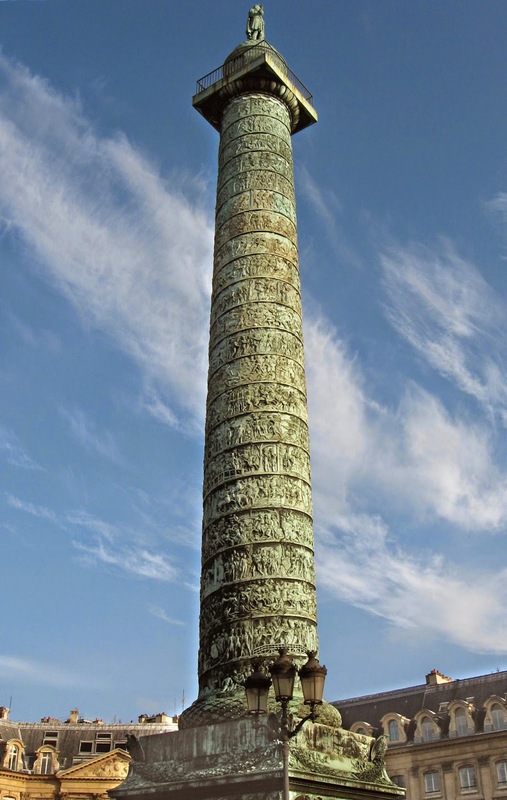 The Place de la Concorde is noted for the Luxor Obelisk, which originally came from the Luxor Temple in Egypt and was given to France by the Egyptian government and installed at this site in 1836. The yellow granite has hieroglyphics praising the pharoah Ramesses II. 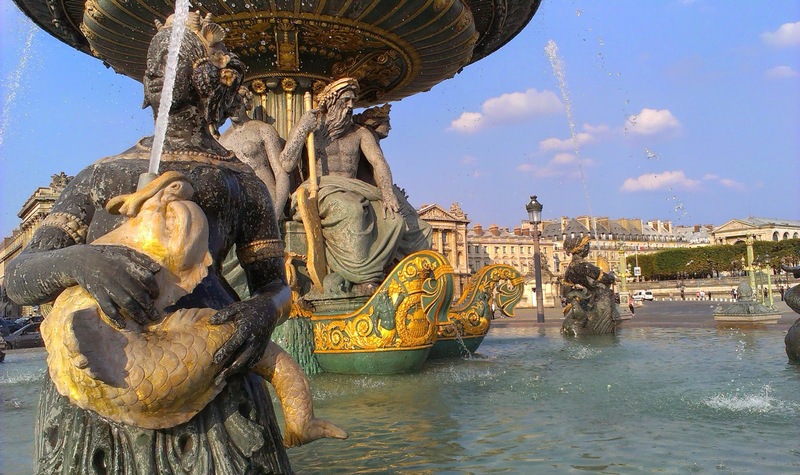 The Place de la Concorde also has two fountains flanking the Luxor Obelisk. They were built in 1840 with the themes of rivers and seas. Detail from one of the elaborate fountains can be seen in the photograph below. This is the 73rd in a series of posts transcribing entries in my mother's 1953 Europe Trip journal. My mom, Geraldine Margaret Guokas, is 86 today! 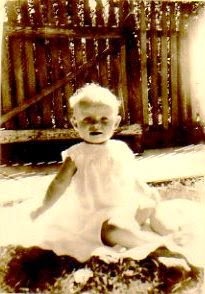 This photo was taken when she was a baby - probably sometime in 1929. Went to Mass at cathedral in Orléans. Decided to drive to Chartres to see famous cathedral. High Mass was going on so didn't get to see much of inside. Then drove to Versailles and drove through grounds -- saw Le Petit Trianon. Got into Paris around 2 P.M. and after just getting lost once found our hotel,* which is very nice and quiet. Before dinner, Joye and I walked along the Place de l'Opera, which is supposed to be one of the best streets in Paris. Had dinner and went to bed. * According to the "HOTELS STOPPED AT" section of the trip diary, my mother and her friends stayed at the Louvois Hotel during their time in Paris. 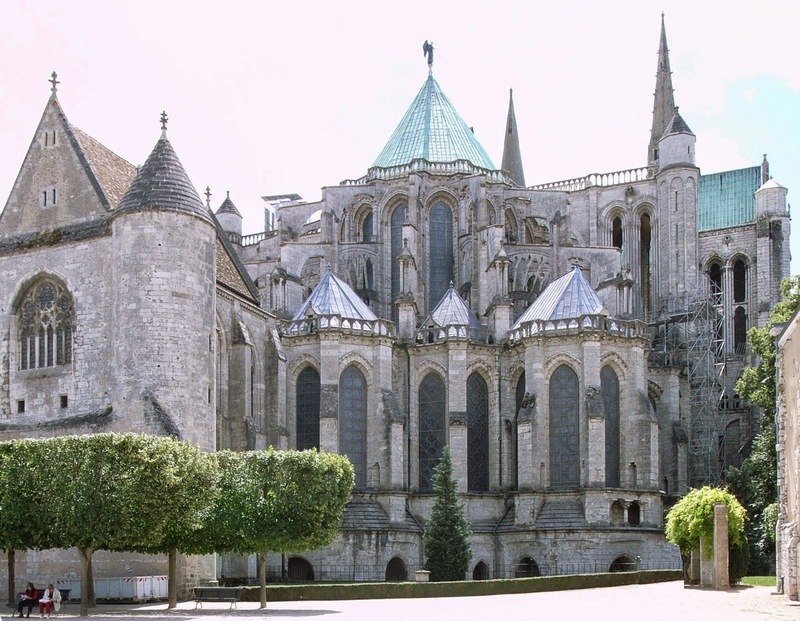 Although she didn't get to see much of the interior of the Chartres Cathedral, Mom likely saw a lot of the Cathédrale Sainte-Croix (Holy Cross Cathedral) in Orléans since she attended Mass there. This gorgeous edifice, pictured below left, was built from 1278 to 1329 and 1601-1829 (after partial destruction in 1568 by Protestants). Joan of Arc supposedly attended Mass here on May 5, 1429 (the Feast of the Ascension) during the Siege of Orléans. 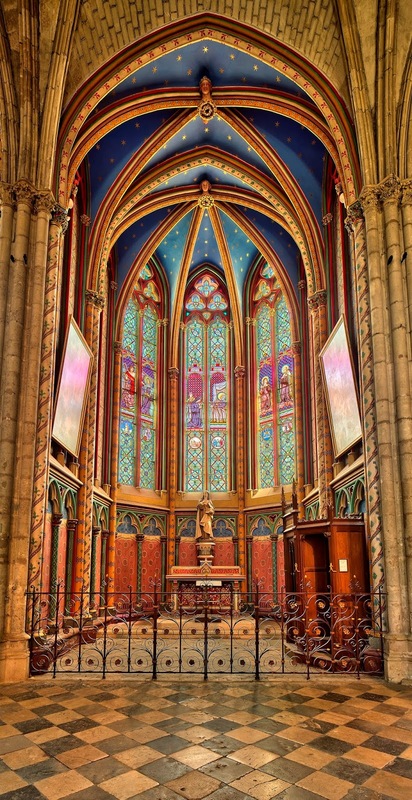 The church has nine chapels in a curved area behind the main high altar, each with a beautiful stained glass window. One of those chapels is pictured below right. 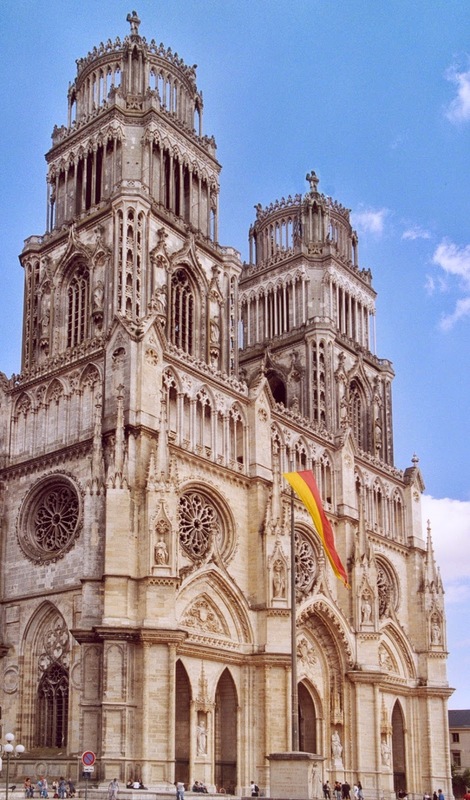 The Basilique Cathédrale Notre-Dame de Chartres (Our Lady of Chartres Cathedral) in the town of the same name was constructed mostly between 1134 and 1250. The building's exterior features heavy flying buttresses, some of which are visible in the photo above (along with the 14th-15th century St Piat Chapel, to the left in the photo). This allowed for large stained glass windows; approximately 152 of the original 176 survive. 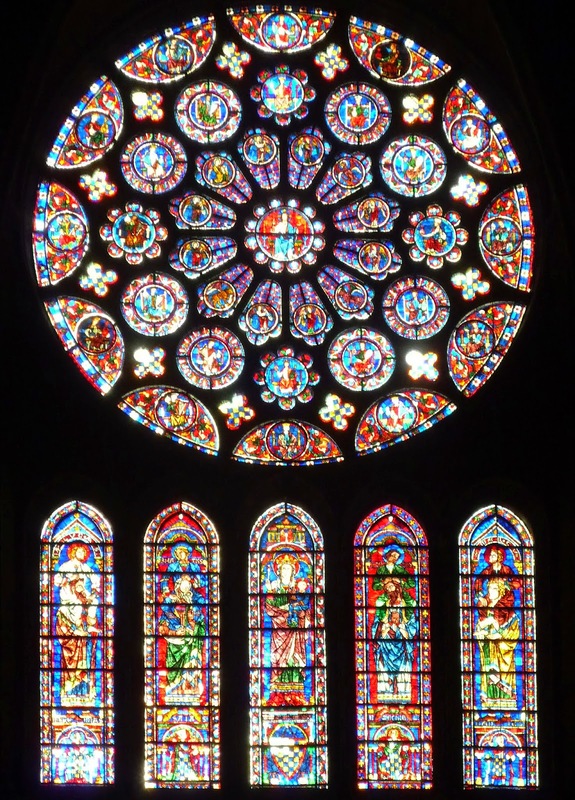 The most famous of the windows is the Notre Dame de la Belle Verriere (Our Lady of the Beautiful Window), pictured above. The central panels that picture the Virgin and Child on a throne held up by angels date to about 1180. The cathedral also has three beautiful rose windows, one of which is pictured at left. 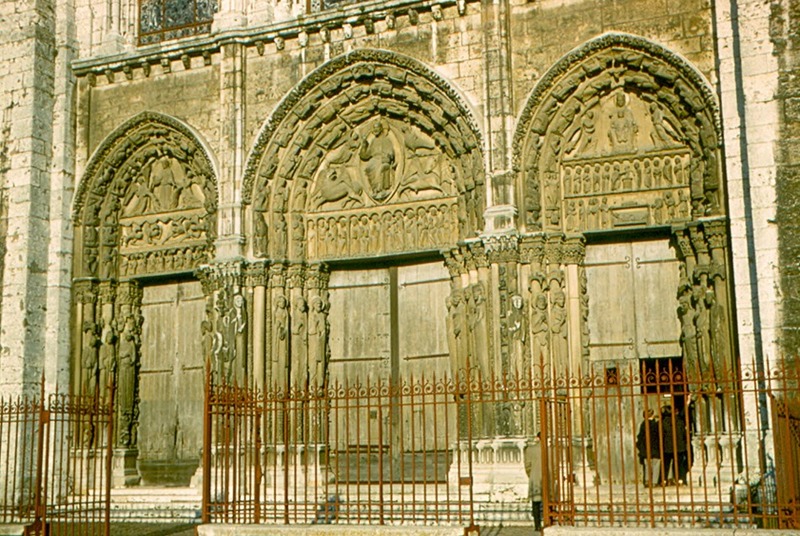 The three entrances or portals in the north, south, and west façades are filled with intricate carvings. The Portail Royal on the west side (pictured below) is part of the original church that (besides the Belle Verriere) survived an 1194 fire. It's called the Royal Portal because of the elegant elongated statues of kings and queens from the Old Testament on the columns by the doors. Le Petit Trianon (pictured below) is a small château located on the grounds of the Palace of Versailles (pictured above). 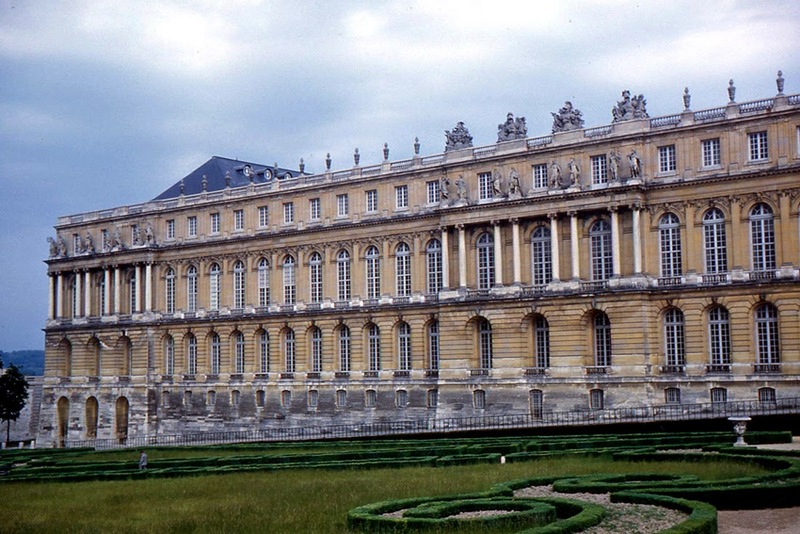 Louis XV had it built between 1762 and 1768 originally for his long-term mistress, Madame de Pompadour. She died before its completion, so it was first occupied by her successor, Madame du Barry. When Louis XVI took the throne in 1774, he gave the château and its surrounding park to his 19-year-old queen, Marie Antoinette, for her exclusive use and enjoyment. Marie Antoinette would come to Le Petit Trianon to escape the formality of court life and shake off the burden of her royal responsibilities. No one could visit Le Petit Trianon without the Queen's permission - apparently not even her husband. The Palais Garnier, pictured above, was named for its architect Charles Garnier and built from 1861 to 1875. 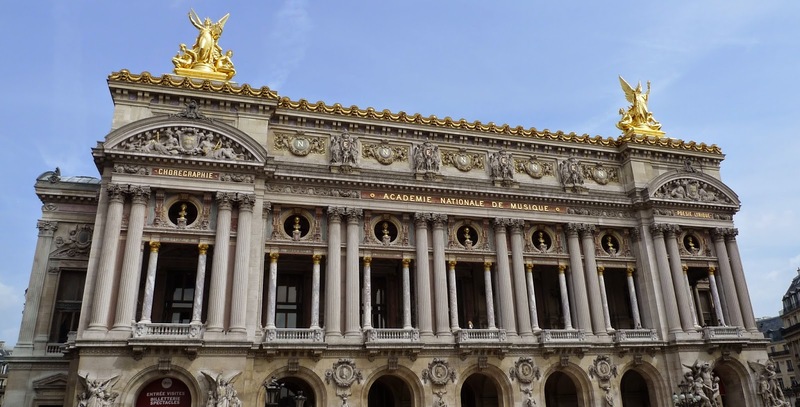 It was the primary home of the Paris Opera and Ballet from 1875 until 1989. At left is a map of the probable route for the day. This is the 72nd in a series of posts transcribing entries in my mother's 1953 Europe Trip journal.